Although standard air conditioners are common, they tend to use a lot of energy. In fact, a recent ASI Controls report indicates that HVAC loads represent the highest energy expenses. Therefore, for large installations like in commercial buildings, installing standard air conditioners can be expensive. Large commercial buildings need a considerable amount of cooling often through water chillers due to their cost-effectiveness and safety compared to having refrigerant pipes throughout a building. As the name suggests, chilled water systems use water chilled in a refrigerant as their main source of cooling. Water is non-toxic, non-corrosive, affordable, and has specific heat value. Therefore, it is a great cooling alternative compared to other refrigerants like ethylene, glycerin, sodium chloride brines, methanol, and propylene glycols. This is a part of the chilled water system where heat exchange between water being transported into the structure and the evaporator occurs. The chilled water exits the evaporator at 7°C or 45°F and is piped throughout the building. The compression chiller compresses the refrigerant gas in a condenser and converts it into a liquid. 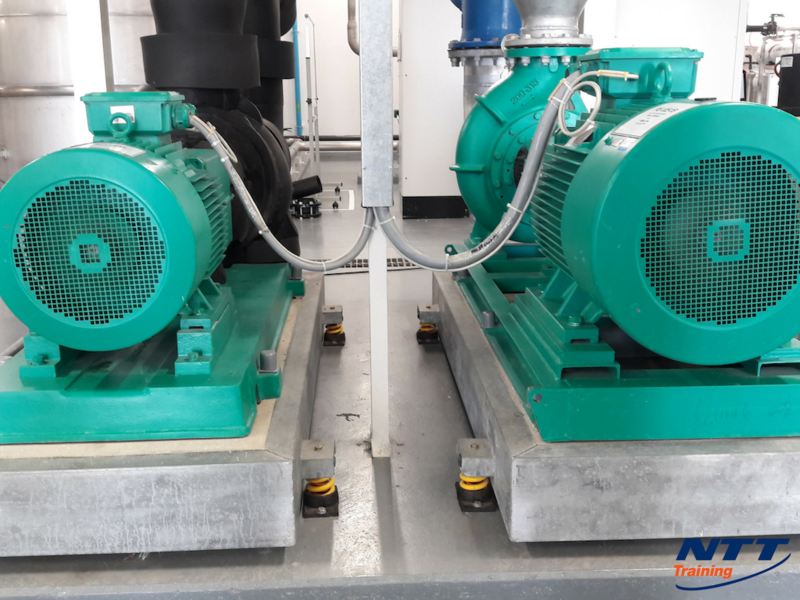 The heat generated from the refrigerant is then released into the water heat exchanger and is pumped to the cooling tower and cooled by releasing the heat out into the atmosphere. Most chilled water systems have water-cooled condensers that use the cooling tower to lower temperatures in the condenser. At the cooling tower, the cooled water enters the condenser at 29°C or 85°F. The water absorbs heat from the condenser and the temperatures rise to 35°C or 95°F. The heated water is piped to the cooling tower where it is cooled by the evaporating water. The cooled water drops again to 29°C or 85°F and is pumped to the condenser again. As the process repeats itself, water should be added to the cooling tower because some of it is lost through evaporation. Adding water to the cooling system is also necessary because evaporation causes solids in the water to become more concentrated. These solids are from minerals and other elements found in tap water. The build-up of solids can damage parts of your cooling system such as the chiller. This technology will enable your employees to monitor this large equipment on a daily basis instead of having to conduct physical checks on a weekly or monthly basis. This technology also allows tracking of chiller pressure, temperature, flow rates, and fluid levels consistently. When your employees are able to compare the daily logs with what the manufacturer recommends, they can detect any flaws early and correct them. The condenser water loops transport water to cooling towers thus releasing heat into the atmosphere. However, the open air can cause entry of contaminants which can cause corrosion, scale, and biological growth. Contaminants can greatly reduce the efficiency of your chilled water system. Trained employees are able to inspect the condenser water loops regularly and check for evidence of corrosion. Additionally, your employees will be able to treat the condenser water to prevent accumulation of contaminants. Water contaminants such as algae, minerals, mud, and scale can build up in the water system tubing and greatly reduce the systems heat transfer efficiency. Lower temperatures may indicate contaminated tubing while lower temperatures indicate heat transfer inefficiency. Although cleaning tubes is only required after every three years, periodic inspection is necessary. Trained employees will be able to conduct tube cleaning procedures which comprise both chemical and mechanical cleaning processes. Chemical cleaning involves the removal of scale, and it’s important that chemical cleanings be tailored to match your water conditions. On the other hand, mechanical cleaning involves physically brushing the tubing to remove algae, mud, and sludge, and flushing the tubes. Would this Benefit your Workplace? When your chilled water system runs continuously, it generates heat and can sometimes overheat. Overheating may lead to failure and expensive repairs. To prevent this, invest in employee training by enrolling them in the NTT Training seminar on chilled water systems operation and maintenance. For more information, call 855-712-7353.